How is your Wednesday going? I’m so glad we’re at the mid-way point of this week as it’s been a long one already! I have the weekend in my sights. I’m happy to be here to share a fun card featuring the new Dare 2B Artzy Playful Posies. These stamps are so fun because they have the wonderful solid flower and then the outline of the flower. You can really play with the arrangement and layering of these flowers and come up with a multitude of different ways to use them. 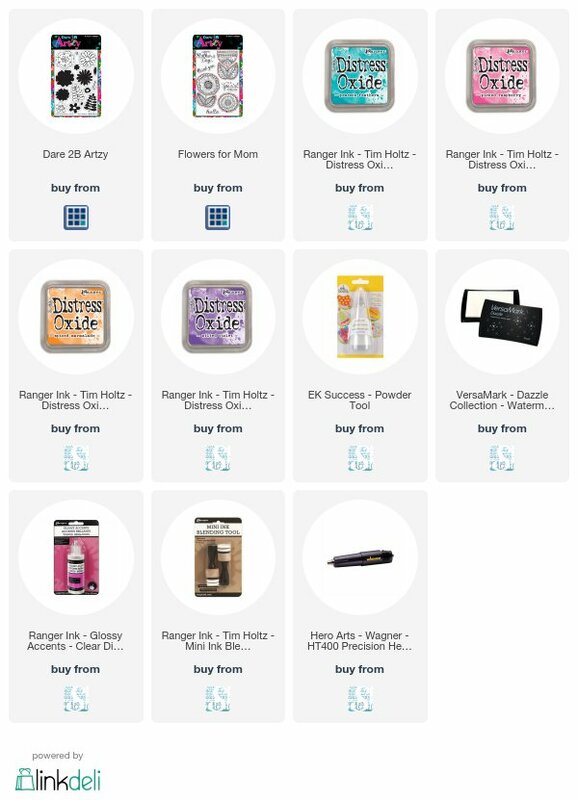 I love stamp sets that offer that kind of variety because you always feel like they’re a good value for your hard earned crafting dollar. Today, I’m going to showcase one way to use these awesome stamps. I’d heard and seen other crafters use their Distress Oxide inks on dark colored cardstock so I decided to try it for myself. I cut a piece of cardstock to 6 x 8 inches so that it would fit inside my MISTI. Next I gathered the Playful Posies solid flower silhouettes from the set and began playing with arranging them onto my cardstock. Once I was satisfied with the placement, I grabbed several of my Distress Oxide inks and began inking up the flowers with some random colors. I’m unsure if it was the brand of cardstock I was using, but I had a bit of a tough time getting a clean image to ink up with the oxides. I had to stamp each of the flowers 3-4 times to get a clean impression. Ultimately they ended up looking OK, but I’m thankful for my MISTI because stamping multiple times with a stamp block is a bit more difficult. I continued stamping and changing up colors for different flowers to get some variation of colors for my background. To fill in some of the gaps, I used the smallest solid pieces and stamped them randomly to fill in some of the larger empty spaces between the flowers. Once I was satisfied with the background, I zapped the background with my heat gun to speed along the drying of the distress inks. I wanted to make sure I didn’t have any areas of wet ink when I used my EK Success anti-static tool, otherwise I’d risk smearing the ink. Once the background flowers dried, they really took on that look of chalk on a blackboard which looks really cool on the black cardstock. Next, I ran my anti-static powder over the entire background. Finally, I stamped the outline flowers from the Playful Posies set with some Versamark ink and sprinkled with some super fine detail white embossing powder. I considered using some different embossing powders for my flower outlines, but wasn’t sure how well they’d show against the black background. I may have to experiment with that in the future. With my background complete, I was able to use a scalloped rectangle that was 4 1/8 x 5 1/4 and die cut it. I cut a second rectangle that was 5 ½ x 4 3/8 to use as my main layer on the card. I cut two sizes of the wide fishtail flags, one from some of the same dark blue cardstock as my background and one from some white. On the white fishtail flag, I stamped and embossed the To a Special Friend message from the Dare 2B Artsy Flowers for Mom stamp set. I sprinkled it with some violet embossing powder and heat set it. It matched the purple in my flowers really well. I added a bit of clear Wink of Stella pen to the outer edges of my flags for just a hint if sparkle. Finally I was ready to assemble all of my layers using some dimensional foam between each layer. I used a white Jelly Roll pen to add some white dots to some of my filler images to give them a bit of detail. Next, I was able to add some silver embellishment gems to the center of my flowers using a bit of sheer glue. I love how the card turned out and the little silver gems add some dimension a bit of pop to the flowers. Hope you’ve enjoyed my take on the Dare 2B Artzy Playful Posies. There are endless possibilities with these stamps and I am really looking forward to playing with them some more in my upcoming posts. 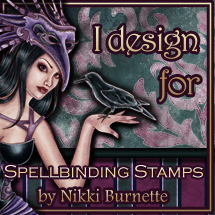 Check out the Dare 2B Artzy store for these new release stamps and so many others including dies, paper and inks. What a great card and your directions and made it sound so easy. Thanks for the post.